Availability groups can no longer be considered new. 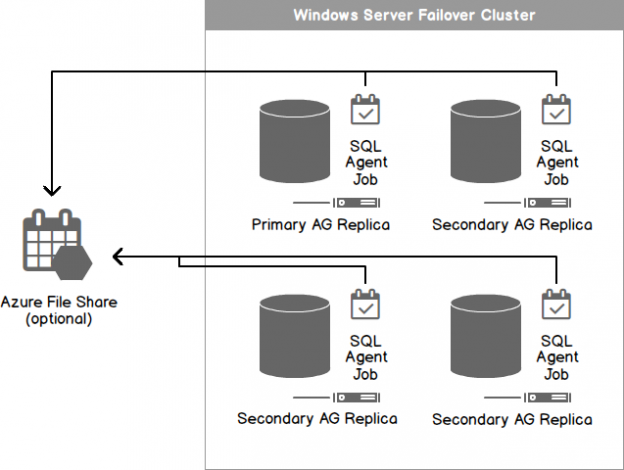 The feature was released in SQL Server 2012 but I often notice that SQL Server Failover Cluster Instances (FCIs) are much better understood. For a very long time, when people thought about SQL Server they thought about the entire instance as a unit. Microsoft has been implementing new features and services which begin to segment the concept of an instance from the concept of a database. With an FCI, which most seem to be comfortable with, your entire SQL Server instance gains high-availability. With an Availability Group (AG), that is not the case. Since AGs only replicate user databases, that means that all data stored in master, model, and msdb will not be handled. Replication of your SQL Agent jobs, linked servers, logins, credentials, and all over instance objects, will not be handled for you. This means that you have to implement a process to do keep all of your cluster nodes synchronized. I wrote about this same topic about two years ago. In that article, I expressed a release based method which would be hooked into your database lifecycle management (DLM) process. Over the years, I found that very few people adopted that way of dealing with their server objects. Shifting-left something like security and other instance level objects did not appeal to many and the method was highly specialized to development shops that used desired state configuration tools to manage their DLM. This article is focusing on a new method that I wrote which is much more generic and fitting for a strong separation of duties between the production DBAs and the development / DevOps teams. The solution that you see below is a PowerShell script which is executed by a SQL Agent job on the primary replica of the AG. While it only executes on the primary replica, the job must exist on all nodes of the cluster and be smart enough to know which node is allowed to execute and which are secondary replicas. The core functionality all resides within the PowerShell script. In the diagram, I show the script in a Microsoft Azure File Share. This is definitely not a requirement. If you prefer, the script could reside on an on-premises file server, locally on each node of your cluster, or even pasted into the SQL Agent job step itself. When I developed this solution, my servers were Azure VMs and I wanted a single piece of code to manage, rather than ensuring that the script was updated on all nodes of the cluster at all times. The PowerShell script relies on the community project dbatools and follows this process flow. A notable limitation of this process is that it does not update existing objects. Jobs which already exist but were updated, will not be altered. I chose to omit that functionality because it presents merge complications and problems. For example, the cleanest way to handle the process would be to drop and create the object each time the synchronization runs. If that happened, however, there would be gaps when logins didn’t exist and applications would fail to connect, SQL Agent jobs would lose history, and/or the processing of a job would fail because it was dropped part way through executing. For this script to work, there are two prerequisites. The prerequisites are required to be installed on all nodes of the cluster. Dbatools PowerShell module version 0.9.24 or higher. PowerShell version 5.0 or higher. Dbatools is a community developed, open-source, PowerShell module. It contains over 200 cmdlets designed to help the DBA with SQL Server administration, migrations, and best practices. I chose to use this tool over rolling my own script because this is a supported platform with a team of experts constantly fixing bugs and adding new features. The long-term maintenance of this entire solution is nearly zero because the dbatools contributors will handle all of the tedium for you. They will update the cmdlets for new versions of SQL Server and they have hundreds of automated unit tests to stress this code base with every change. Even outside of this one-use case, I highly recommend to look into what dbatools has to offer and how it can help optimize your day. You can download and install the prerequisites yourself. I prefer scripting out installs, however. For that I recommend reviewing this article by Mike Robbins on scripting out the installation of PowerShell version 5.0 and you can use the below script to install dbatools by running a PowerShell console window as administrator. Full PowerShell script and SQL Agent job T-SQL script available for download here as a zip file. The storage account’s primary or secondary key. This script will detect your Availability Group primary replica and copy all of its instance level objects to all of the secondary replicas within the Availability Group. One limitation of this script is that it assumes you only have one availability group. <# Works but needs to run as admin which our SQL Agent is not going to do. Write-Output "Begin query of Availability Group state." Write-Error "Availability Group state query returned no results. Confirm that you connected to a SQL Server instance running an Availability Group. No work was accomplished." Write-Output "Completed query of Availability Group state." # Only runs if it is the primary, secondaries remain idle. Write-Output "Copying objects from $DataSource to $SecondaryReplica"
Write-Output "Copy complete from $DataSource to $SecondaryReplica"
Write-Output "No work accompished, this is not the primary node."